If you are anything like me, you enjoy a little wine with your meal here and there, and mac and cheese is no exception. Over the last year or so, I've had a lot of fun trying different types of wines and learning more about what types of wine go with different types of food. I'm lucky to live near such a world famous wine-growing region, so it's been really fun to take trips up to the Napa and Sonoma Valleys and make an experience out of trying wine. 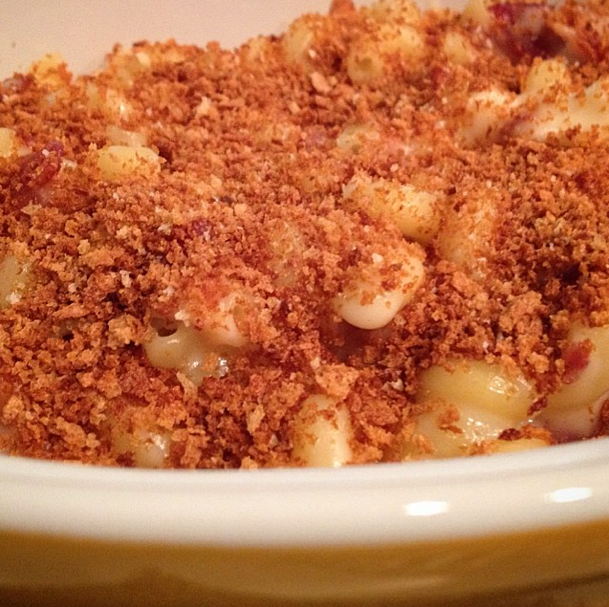 So, the question is: what kinds of wines would go well with your mac and cheese? That's why you're really reading this. Well, after researching and trying many different styles of wine, I've put together a quick guide for you! Below are some types of cheese you might use and the wine that might go best with them. It's important to remember that your additions (garlic, bacon, peas, etc.) will change the overall flavor of your mac. A tip I've always tried to remember when pairing wines is that stronger flavors will require stronger wine, so a smoked aged cheddar will pair well with a deeper red, like a Cabernet Sauvignon or Malbec. Something with lighter flavor will pair better with a lighter wine, like a Sauvignon Blanc, Chardonnay or possibly a Pinot Noir. From there you can try to play around with sweet, rich, bold and dry flavored styles of red and white wines. I found that a garlic mac works well with both a Chardonnay (rich) and Moscato (sweet) wine. Both are considered white wines, but each has very different flavors. What's your favorite pairing? Have fun exploring!